The earliest record of writing in Japan is a record of correspondence between the queen Pimiko (c. 170-248 AD)—Himiko in Modern Japanese—and the Cao Wei kingdom in China. This is interpreted either to mean that Himiko and at least some of her court officials were literate, or that Himiko dictated to Chinese scribes who took up residence in her court (the second option is more likely). Either way, it is certain that literacy was not widespread during this era. Japan’s first two major works, Kojiki and Nihonshoki, state that Korean teachers from the kingdom of Paekche brought Buddhism and writing to Japan. Writing became extremely popular under Empress Suiko (r. 592-628). Inscriptions from this time period include the Gangouji tray, the Gangouji Jouroku Sakyamuni halo, the Houryuuji Yakushi Buddha halo, and the Tenjukoku mandala. These inscriptions, as with all others from this time, include only proper nouns (with one exception). Overall they contain 60 of the estimated 87 syllables of Old Japanese (Modern Japanese has only 46 “legitimate” syllables). The remaining 27 were infrequently used and so were statistically unlikely to be included on any inscription. Other extant writings from before the Nara Era include the Taihou census of 702, the four poems of Jogu Shoutoku hou-ou teisetsu, various inscriptions, and various edicts and liturgies. If a writing used Chinese syntax it was called 純漢文 (junkanbun, “pure Chinese writing”) but if it used Japanese syntax it was called 変体漢文 (hentaikanbun, “perverted Chinese writing”). Beginning with the Heian Era the use of junkanbun declined over time, and especially from the start of the Kamakura Era when Japan was governed by warriors who had little time for such elaborate writing. There were, however, some well-educated samurai who mastered and used hentaikanbun—­government edicts generally were written in hentaikanbun from the Kamakura Era to the Meiji Era. Hentaikanbun was defined by its lack of standardization and by the 7th century there was at least one extant inscription written entirely in the Japanese word order. Most of the writings mentioned above, aside from the inscriptions, used a style known as 宣命書き (senmyougaki, “edict-writing”). This style used small phonograms for particles and inflections in addition to the regular-sized characters which were used as semantograms that represented the nouns, verbs, etc. These phonograms may have been included because edicts were meant to be read aloud; the phonograms aided the speaker in reading the Chinese script with Japanese word order and grammar. We can reconstruct Old Japanese pronunciation fairly accurately by looking at the Chinese characters that ancient scribes used when writing Old Japanese. Writers of Old Japanese always used Chinese characters (or kanji) for their sound value with no regard to meaning. The kanji 乃, for example, means “therefore” or “whereupon” in Chinese but Japanese writers used it for the sound no, which is also the possessive particle in Japanese. (As an illustration, the section header at the top of this paper uses a string of kanji for their sound values in the same manner as Old Japanese, and the Modern way of writing is in parentheses following.) By the reign of Suiko, however, it was no longer a guarantee that kanji were used only for their sound values. Senmyougaki, in fact, did not use any kanji for sound values except for the small kanji being used for particles. By the 9th century kanji usage became inconsistent and could vary from writer to writer and from convention to convention. Sometimes a poem was recorded in two different books using two different writing systems. This is very helpful for confirming the pronunciations of characters. Some works used two or more writing systems. Kojiki, for example, used senmyougaki for its prose section but the old phonetic system for its poetry. The Man-youshuu, an anthology of ancient poems, was written primarily in 戯書 (gisho, “playful writing” or “rambling writing”) which used characters either for their meaning or their sound, and furthermore could use either the 音読み (on-yomi, “sound reading”) or 訓読み (kun-yomi, “meaning reading”) that had developed by that time. Basically, gisho recorded Japanese in the most convoluted way possible and has been nearly impossible to read by a layman since the 11th century. Aside from its variant readings, gisho also included puns and plays-on-words that required lateral thinking. Possibly the best example of this is to be found in the pronunciation of the number 十六 (juuroku, “sixteen”) as 獅子 (shishi), meaning “lion.” The number four is pronounced shi, and four times four equals sixteen. To put it another way, the word was written as “sixteen,” read as “four four,” and understood as “lion.” Clever. Although every Japanese work was written exclusively with Chinese characters, there were very few Chinese words in the pre-Nara works overall. Most of the Chinese (and Sanskrit) words that were used were Buddhist terms that had no Japanese equivalent. As time went on there were steadily more writers from different walks of life—a few of them used many foreign terms but most of them used none. Genji Monogatari, the most famous and well-respected Japanese work of the Heian Era, used only a few Chinese words, and only the ones that the intended audience was assumed to understand already. The use of Japanese vocabulary was simply called 大和言葉 (Yamato kotoba, “Japanese words”). When there was no Japanese word for something, writers either used existing Japanese words in a different context or coined new ones. This practice flourished during the Heian Era but declined afterwards. Before and after the Heian Era, but not during, new words were sometimes given kanji based only on sound. This practice is called 当て字 (ateji). The word 面白い (omoshiroi), for example, means “interesting” but consists of the kanji for “face” and the kanji for “white.” The meanings of those kanji are irrelevant in the word 面白い; the sounds just happen to fit. When using a kanji for its sound value, Old Japanese writers could select from any number of kanji. For example, the sound a could be written using安, 阿, 悪, 亜, or 愛. The hiragana letter あ (a) was derived from the kanji 安 and the katakana letter ア (also a) was derived from阿. Therefore we know that whenever these kanji appear in an ancient work and they are being used for their sound value, that sound is always a. This consistency enabled Japanese scholars of later generations to infer correct readings with about 90% accuracy. Unfortunately Japanese was strongly influenced by Chinese at several points throughout history so not all pronunciations are preserved. Although阿 and亜 are still pronounced a (by the onyomi) in Modern Japanese, 悪is now pronounced aku and愛is pronounced ai. These do not represent natural changes in the language over time. Another effect that these waves of influence had was to increase the number of readings of certain kanji. Although most kanji have two or three readings (one or two onyomi and one or two kunyomi), some can have over a dozen. The character 安, for example, only has one onyomi, an (formerly a), and one kunyomi, yasu. 悪, on the other hand, has two onyomi, aku and o, and a staggering seven kunyomi: waru, a, niku, aa, ita, izukuni, and izukunzo. Fortunately, although the sounds have changed the characters are visually pristine. All Chinese characters are referred to as 漢字 (kanji, “Han [Dynasty] character”) because Classical Chinese characters were finalized by the end of the Han Dynasty. The first time that Japanese was influenced by Chinese was in the 6th century when writing was imported. This first group of readings is called 呉音 (Go-on, “[Kingdom of] Wu sound”). An example of a go-on reading is myou for 明. Because the Koreans pronounced Chinese characters with a Korean accent, the pronunciations that the Japanese learned from them in the 6th century were not authentic. For this reason these readings are described as “imitations of Korean imitations.” The second wave of aural influence came during the T’ang Dynasty of China in the 7th-9th centuries; these readings are called 漢音 (Kan-on, “Han [Chang’an] sound”) and were brought directly from Chang’an by Japanese scholars. An example of a kan-on is mei for 明 as opposed to myou; both readings are still in use for different words, such as 明瞭 (meiryou, “clarity”) or 明星 (myoujou, “morning star”). The third major wave of influence occurred during the Sung Dynasty in the 14th-16th centuries; these readings are called 宋音 (Sou-on, “Sung [Dynasty] sound”). Most of these readings were imported piecemeal and used for specific words rather than systematically applied to kanji across many words; the sou-on reading min was created and applied to the kanji 明 to mean “Ming [Dynasty].” As with most other sou-on readings, the reading min has to this day only been used for the word for which it was created, namely, “Ming.” If not for these three Chinese onyomi, 明 would likely just have the native Japanese kunyomi aka and aki. Japanese today is written in a mixture of kanji, the odd Roman letter, and a syllabary known as仮名 (kana). The word 仮名 literally means “informal name” or “temporary name,” alternatively written as 仮字, meaning “informal character” or “temporary character.” Kana is divided into two versions which have identical sounds and syllables, but are written differently. They are 平仮名 (hiragana, literally “ordinary kana”) and 片仮名 (katakana, literally “fragmentary kana”), In Modern Japanese hiragana is used a majority of the time whereas katakana is used primarily to write foreign loan-words. This rule, however, was not instituted until 1946; before then, there were no rules. Japanese writers composed poems in Old Japanese using Chinese script, but they also wrote Chinese and studied Chinese poetry. The popularity of Chinese study varied through the ages. It reached its height of popularity in the early 9th century, during which the use of the aforementioned “small phonograms” in senmyougaki declined in use. With the fall of the T’ang Dynasty of China in 907, interest in Chinese quickly fell and Japanese composition experienced a dramatic resurgence. Along with this resurgence came the adoption of kana. Kana was developed in the 9th century, with the oldest known writing dating to 828. Katakana characters were originally used only for particles and were called ヲコト点 (wokototen). Similarly to the small kanji used for particles in senmyougaki, these were utilized to aid reading in Japanese word order. Katakana was used at first on a person-to-person basis and gradually spread in popularity. Wokototen were written in red or white ink whereas the ordinary characters were written in black. Many students also began to write in only katakana while listening to lectures in order to take notes more quickly. The two kana systems came about in their own way. Hiragana was derived from cursive versions of kanji. As cursive writing was already common in China and Japan, these characters were called “ordinary kana” as mentioned before. Katakana, as the name suggests, was taken from fragments of kanji. The concept of writing only part of a character (e.g. 寸 for 村) had been in use in China for centuries, but was always a placeholder—never officially recognized and never standardized. It was only in Japan that the practice became universal. By the end of the Heian Era there were eight different schools of wokototen. In Figure 1 each kana letter is shown on the left side of the cell and its corresponding kanji on the right (in the hiragana chart there is also a third “intermediate” character). If we look at a kanji that a hiragana and katakana letter have in common we can see the two different approaches to its adaptation. The kanji 久 (ku), for example, was written in cursive to derive the hiragana letter く and a part of the kanji was removed to make the katakana letter ク. There were originally well over 50 kana, but many of these slipped away; most of them almost immediately and others in the centuries to come. The famous pangram poem “Iroha,” written no later than 1079, shows us that by then the syllabary included the 46 letters of modern kana (except for ん which was represented by む) as well as wi and we–yi and ye had fallen into disuse. By the year 1000 there was often confusion between い (i), ゐ (wi), and ひ (hi); え (e), 𛀁 (ye), and へ (he); お (o), を (wo), and ほ (ho); わ (wa) and は (ha); and う (u) and ふ (fu). Writers in the Kamakura and Muromachi Eras attempted to follow established pronunciations but with little success because some sounds had been lost and others had changed. Fujiwara no Teika was the first person to have any success with following and recommending Heian Era standards for kana usage; his one mistake was in confusing お (o) and を (wo). But to be fair, even in modern-day Japan the letter を is more often than not pronounced o. The 14th century scholar Byoua studied Teika’s work and wrote the book Kanamojizukai (“How to use kana”). Because Teika had achieved an authoritative status by then, his spelling system became more or less dominant. The creation of hiragana is traditionally attributed to the priest Koubou, but this is doubtful. It is more likely that its creation was a collaborative effort, and it is known that there were multiple competing versions of kana letters for centuries afterwards. Katakana had a certain uniformity by the 10th century, but hiragana, being cursive and associated with poetry and fiction, had far less rigidity. Aside from the appearance of kana letters, deciding which set to use was also up to the author. Different writers had different ways of writing, and as time went on these changed. Of the three earliest copies of the book Sanbou e-kotoba, one is in hentaikanbun, one is in hiragana, and one is in a mixture of katakana and kanji. For the first few hundred years, hiragana was considered feminine and was called 女手 (onnade, “female hand”) whereas katakana was called 男手 (otokode, “male hand”). Women writers used only hiragana and male writers wrote in either katakana, kanji, or a mixture—the mixture was called 仮名交じり文 (kanamajiribun, “mixed kana writing”). The male author Ki no Tsurayuki had to use a pen name in order to write and publish works in hiragana. When men corresponded with women, however, they wrote only in hiragana. Some conventions were universal, however. During the Heian Era letter-writing came to use the honorific term 候 (sourou, “to attend”), and the style that used this honorific was known as 候文 (souroubun). Souroubun continued to be used as the official letter-writing style up until the mid-20th century. The narrative prose of Heian Era writings used honorifics, as opposed to modern-day narratives that virtually never do. Just as with kanji pronunciations, kana has also experienced subtle changes over the years. Most scholars believe that the “H” row was originally pronounced “P,” i.e. pa, pi, pu, pe, po; but by the Muramachi Era the row had become “F,” i.e. fa, fi, fu, fe, fo. That is why the title of this paper is “From Pimiko to Fimiko.” It is a great blessing that we have external proof of these changes. Portuguese Jesuit missionaries quite actively published a wide array of books throughout the 1590s, including works published in Japanese but using the Roman alphabet. They therefore captured an accurate snapshot of Japanese pronunciations at the end of the 16th century. That is genuinely exciting. Kana originally had no 濁点 (dakuten, “marks for voiced syllables”). The marks ゛and ゜were adopted by the end of the Heian Era but didn’t become universally used until the Edo Era. Before this, the lack of voiced marks meant that there was much greater potential for puns and plays-on-words. In Modern Japanese the letter は (ha) is visually distinctive from ば (ba) and ぱ (pa). A modern Japanese author could use the letter は to mean 歯 (ha, “tooth”), 葉 (ha, “leaf”), or even 破 (ha, “middle section of a song in Noh theater”), but a Heian Era author could also use は to mean 場 (ba, “place”) or simply ば (ba, “because” [archaic usage]). Although Japanese is astoundingly difficult for non-native speakers to wrap their heads around, the rich tapestry of sounds and characters enable authors to exercise great creativity with their choice of words and sounds. It is admirable that the Japanese people were able to take a concept hitherto unknown to them, writing, and make it their own in such a wonderfully unique way. Japanese writing would undoubtedly have been improved by a lesser reliance on Chinese influence through the centuries and a firm commitment to consistency, but despite this over-complication the system is still mostly logical in its approach to representing sounds, and has charm all its own. Habein, Yaeko Sato. The History of the Japanese Written Language. University of Tokyo Press. 1984. Print. Miyake, Marc Hideo. Old Japanese: A Phonetic Reconstruction. RoutledgeCurzon. 2003. Print. Seeley, Christopher. A History of Writing in Japan. University of Hawaii Press. 1991. Print. 私の名前はジョンです。歴史について読みましょう。(My name is John. Let’s read about history.) Japanese writing has a rich and varied history that has resulted in an equally rich and varied tapestry of symbols and orthography. Japanese writing uses a combination of three writing sets. They are 漢字 (kanji, “Chinese characters”), 仮名 (kana, “temporary names/characters”), and ローマ字 (roomaji, “Roman characters,” i.e. the Latin alphabet), which is the least extensively used of the three. But in order to understand the complexities of the written Japanese language in the modern era, we must first briefly look at its origins 1,500 years ago. Writing was introduced to Japan in the 6th century by representatives from Korea, who brought Chinese writing with them. At first the Japanese used Chinese block script and tried to read it in Japanese, but eventually the script was modified for Japanese word order and/or Japanese sounds (that is, the characters were used for their sounds with no regard to their meaning). Then in the 9th century Japanese scholars and students simplified kanji into a syllabary called kana. There were two versions of kana, 平仮名 (hiragana, “ordinary kana”) and 片仮名 (katakana, “fragmentary kana”). Both kana versions have the same letters that make the same sounds, but they are written differently. The first five letters of kana are written like this in hiragana, あ い う え お, and like this in katakana, ア イ ウ エ オ. The two versions bear little if any resemblance to each other because they were derived in two different ways. Whereas hiragana was simply a cursive form of the kanji, katakana was made by isolating a fragment of the kanji, hence the name. The kanji 久 (ku), for example, was written in cursive to derive the hiragana letter く (ku) and a part of the kanji was removed to make the katakana letter ク (ku). Kana was originally used by students to speed up note-taking during lectures. Temporary characters had been in use by the Chinese for centuries, but the Japanese took things a step further by making these temporary characters permanent. Thus within a century two fully-developed sets of kana emerged. In a very short time hiragana came to be strongly associated with women and was known as 女手 (onnade, “female hand”) while katakana was likewise known as 男手 (otokode, “male hand”). In the Heian Period (794-1185) women wrote in only hiragana while men wrote in only kanji, in only katakana, or in a mixture simply called仮名交じり分 (kanamajiribun, “mixed kana writing”). And because women wrote mostly poetry and fiction while men wrote mostly scholarly works, there was also a strong association with genre. Beginning in the Kamakura Period the male/female association was no longer as strong and many texts used both hiragana and katakana, but the association with genre was still just as strong, with scholarly works predominantly using katakana and poetry using predominantly hiragana. Although katakana was more-or-less standardized by 1000 AD, hiragana had several different versions of each letter up until and even after the Meiji Period (1868-1912). The main reason for this was the different nature of each script. Because hiragana was used for creative works, it lent itself to diverse interpretations. Katakana, on the other hand, was used for scholarly writings, official documents, dictionaries, and the like, and so was not conducive to creative freedom. The printing press, introduced to Japan in the late 16th century, was a driving force for the gradual standardization of hiragana because it “locked-in” specific orthography and eliminated scribal idiosyncrasies. It took hundreds of years to fully and finally standardize hiragana, however, and historical variants are collectively known as 変体仮名 (hentaigana, “variant kana”). To complicate matters further, even the sounds that the letters represented could be varied. Many sounds were confused in writing starting around 1100 AD, and thus certain letters were used interchangeably, such as は (ha) and わ (wa) or お (o) and を (wo). The 17th century scholar Keichuu noted that ancient writings (i.e., pre-1100 AD) used spelling that was mostly consistent, and he recommended that modern spelling be modified to match ancient spelling. His ambitious work also included a dictionary with 2,000 words showing the kanji, correct kana spelling, and author’s remarks for each entry. About 75% of his reconstruction was correct, which is impressive considering that he didn’t have access to nearly as much information as we do in the modern day. Initially Keichuu’s writings found little success outside of the closest academic circles, but by the Meiji Period, after many other scholars had edited, supplemented, and written commentaries on Keichuu’s work, it eventually became popular and well-respected enough to be used in schools, and quickly became the standard spelling system until the sweeping post-WW II reforms, when it was replaced by 現代仮名遣い (gendaikanazukai, lit. 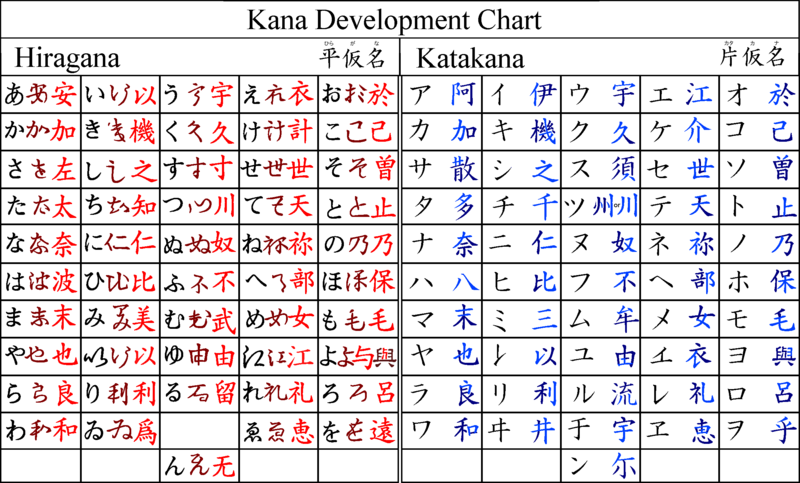 “Modern kana usage”). Also during the Edo Period, hiragana began to be used more and more for everyday writing while katakana was used for government edicts and was occasionally used for foreign loan words. Most government edicts in the Meiji Period were written with kanji and katakana. Aside from kana usage, there were many minor changes that took place in Japanese writing after 1600. For example, it wasn’t until the Edo Period (1603-1868) that distinguishing marks called dakuten ( ゛) and handakuten ( ゜) became popular. These marks are used to show the difference between voiced and unvoiced sounds, such as か (ka) becoming が (ga), or は (ha) becoming ば (ba) or ぱ (pa). And starting from the middle of the Meiji Period the ends of sentences were marked with “ 。” and the ends of clauses with “、”. With the proliferation of the printing press came wider audiences for books (with varying levels of literacy). Some books were written in only kana for the sake of ease, and most books for commoners that did use kanji included kana above or next to them called 振り仮名 (furigana). The word nihon (Japan) written in kanji appears as 日本, in kanji with furigana as 日(に)本(ほん), and in kana as にほん. The inclusion of furigana meant that anyone could understand any writing because they could simply read the furigana, but it also meant that writers had an excuse to include complicated kanji and unconventional readings. Literacy reached new heights in the Edo Period, and writers, for the first time since the Kamakura Period (1185-1333), represented all walks of life. Both writers and readers could be scholars, workers, rich, poor, and everything in between. Many writers used 当て字 (ateji, literally “called upon character”) which were kanji used only for their sound values. Some ateji were impossible to read without furigana, especially with different authors using whatever readings they wanted to. The word 活業 meaning “vocation” could be read しょうだい (shoudai), いとなみ (itonami), たつき (tatsuki), ないわい (naiwai), or すぎわい (sugiwai). In those days ateji were also used for foreign loan words if their sounds fit within the Japanese phonic set. The word sushi was written with the ateji 寿司 and continues to be written as such today. In cases where foreign words would not fit into the Japanese phonic set, the word was often written in kanji with furigana that approximated the sound. The word “telegraph,” for instance, was written as伝信機 (denshinki), and the furigana would read テレグラフ or てれぐらふ (teregurafu). Both hiragana and katakana were used for furigana until after World War II, when hiragana was prescribed for furigana while katakana was prescribed for standalone foreign words. Today loan words are approximated using katakana but there are no kanji assigned. The word “computer,” for example, is rendered only as コンピューター (konpyuutaa). Today, for purely stylistic reasons, many Japanese persons use hiragana for occasional foreign words or katakana for certain native words. It’s not uncommon to see a bistro with a sign that saysびすとろ (bisutoro in hiragana) instead of the proper katakanaビストロ, or to see someone send a text message that puts the native Japanese word “cool” as カッコイイ (kakkoii in katakana) rather than the hiragana かっこいい. The study of Chinese reached a peak during the second half of the Edo Period. This widespread study steadily influenced vocabulary and kanji usage in everyday life. Publications for the educated elite included more and more kanji as the years went by, often without furigana. Chinese and “nouveau” Chinese words entered Japanese at an alarming rate, often supplanting previously-used Japanese words. An easy comparison can be made to medieval English, when words from Latin and Greek (among others) were imported with gay abandon. At the same time, however, there also arose a field of study called 国学 (kokugaku, literally “study of country”) centered on Japanese writings, art, history, language, and religion. Such study often fell victim to nationalistic politics which denounced all things foreign. Such writers refused to use 音読み (onyomi, “Chinese readings”) and 漢語 (kango, “Chinese words”). In the Meiji Period (1868-1912) when there was a huge inflow of information from the western world, views on writing changed drastically. There was a sudden realization that Chinese study wasn’t as important as previously thought, and the use of kanji didn’t need to be the authoritative standard. Consequently during the Meiji Period Chinese literature and the Chinese style of writing once again lost their prestige (the first time being in the Nara Period [710-794]). Despite the use of colloquial language in dialogue sections of literature, the overall writing style was different from spoken language beginning in the Muromachi Period (1336-1573) and lasting until the Meiji Period. The gulf between written and spoken language became so wide by the Meiji Period that it resulted in the term 言文二と (genbunnito, “two languages”). There thus arose a movement in the Meiji Period called 言文一致 (genbun’itchi, “language unification”). The primary driving force for this movement may have been the forced opening of the country to international trade in 1855. The Japanese could suddenly see clearly that Japan was a backwards country and was the only East-Asian country to not be occupied or colonized by foreign powers. Hoping to avoid such a fate, the Japanese people decided to embrace Western ways and rapidly modernize Japan. Perhaps it was inevitable that in trying to figure out what worked and what didn’t work, they would turn their eyes upon their peculiar language. It became well-known that westerners had no need to choose between two languages, and with only 26 letters (give or take) anyone could learn how to read any book. Along with the move toward a unified writing style, there was a push toward a unified orthography, and with it a raging controversy. One of the earliest proponents of genbun’itchi was Maejima Hisoka (1835-1919), who advocated writing only in kana. Another early proponent, Nishi Amane (1829-1897), advocated abolishing the entire writing system and adopting roomaji (Roman characters) instead. Yet another proposal was to keep kanji but limit their number to only the most necessary and most commonly-used. Fukuzawa Yukichi, a noted educator and author, recommended limiting the number of kanji for general use (but not for specialized use in scientific fields, etc.). In his 1873 book Moji no Oshie (“Lessons on written characters”), he included a section of 938 essential kanji and advised allowing for a total of 2,000-3,000 kanji. His proposal never attained any success during his lifetime, but in 1923 the Ministry of Education selected 1,962 essential kanji. The complexity of the Japanese language in general was cause for concern during the war because it was already well-known that Japanese is difficult to learn both by Japanese children and by foreigners. A political leader and educator (eventually the Minister of Education) named Mori Arinori was troubled by the perceived inadequacy of Japanese for education of the people, and he was not alone in this. Underlying this concern about Japanese language acquisition was the fear that the language itself may be inferior. This made it all the more important (as far as the government was concerned) to have a unified, modern language that could compete on the world stage. During the Meiji Period there were two major pushes to simply replace Japanese with another language. The first was spearheaded by Mori, who wished to have his countrymen adopt English. He asked Yale University’s William Dwight Whitney, universally considered an authority on all things linguistic, about whether the change would be feasible and worthwhile. Whitney responded negatively to both. The second push came directly after World War II when there were many suggestions floating around to “do something about the Japanese language” in the wake of total defeat. The influential author Naoya Shiga wrote in 1946 that the inferiority of Japanese was holding the country back, and he knew well that adopting a different language would necessarily solve the problem of Japanese script automatically. Drawing from the work of Mori, Naoya imagined that adopting English would be a very wise choice (and as an aside noted that he thought French was the most beautiful language in the world). Naoya’s articles have elicited reactions from anger to jubilation, from incredulity to persuasion, but shock most of all. In 1900 genbun’itchi came to be considered the most important linguistic issue facing the country and all other concerns were put on the back burner—thus for the most part, genbun’itchi was fully implemented by the end of the Taishou Period (1912-1926). The language of the average resident of Tokyo came to be considered the de facto national writing style as it was argued that everyone in Japan could understand the Tokyo dialect but not the other way around, and reforms were made to writing, but there were no abolitions. That wouldn’t be planned until later. In April of 1942 the chair of Kokugoshingikai (“Council of the Mother Tongue”) told the newspaper Asahi Shinbun that the council intended to reduce the use of kanji until they eventually fell into total disuse. There was intense backlash from supporters of kanji who would not stand to see their elimination. In response to this, the Ministry of Education published a new list in December 1942 containing 3,669 kanji, far more than the 2,454 on the previous list, and explained that there was no plan to abolish kanji. After this, the protestors relented. In 1946, however, the Ministry of Education chose to minimize the number of kanji and so published their 当用漢字表 (touyoukanjihyou, “list of kanji for general use”), with 1,850 kanji. They did intend to eventually abolish kanji, but traditionalists accepted the touyoukaajihyou as a reasonable compromise. Because it would be very difficult for the government to withdraw this compromise in favor of more far-reaching reform, the plan to eventually abolish kanji soon dissolved. It seemed that there was no hope of dramatically reducing their numbers. On the contrary, in the years since 1946, the quantity of general-use kanji has only increased. In 1981 the Ministry of Education published a list called常用漢字 (jouyoukanji, “Regular-use kanji”). It contains all the kanji of the touyoukanjihyou, but with an added 95 kanji for a total of 1,945. The list was further revised in 2010 to remove five kanji and add 196 more, for a total of 2,136. Meanwhile ordinary Japanese persons are using fewer kanji in their everyday writing. On page 5 it was mentioned that a Japanese text message may stylistically write the word かっこいい as カッコイイ, but what wasn’t mentioned was that the kanji form格好良い is almost never used. In fact, this word processor doesn’t even recognize writing it that way. As Japanese citizens continue using fewer kanji and the government keeps pushing for more, there is the distinct possibility that Japanese could be heading for another genbunnito situation. There are no easy answers. Getting rid of kanji would make learning to read and write easier, but there would be an immense loss of etymology. For example, the word 東 (higashi, “east”) is read as tou when part of a compound, such as in the word 東京 (toukyou, “Tokyo,” lit. “Eastern capital”). There are 37 other kanji within the jouyoukanji that are also read as tou. Because of this, abolishing kanji would mean that Japanese speakers would know little more about the name toukyou than English speakers do unless they were to ask an elder what it means. Circumventing this problem would require heavily modifying the language itself and getting rid of the alternate readings brought over from China. If Tokyo were called ひがしきょう (higashikyou) instead of とうきょう (toukyou) then abolishing the kanji would be clean and (mostly) painless. But to implement such a change would be nigh impossible. Another problem lies in spacing. Japanese has no spaces between words and the interspersion of kanji between letters helps the reader to parse words. All-kana writing would be difficult to read. The obvious solution would be to insert spaces between words, but then we run into another problem. Japanese is a highly agglutinative language and it is often difficult to tell where one word ends and another begins, especially with compounds, as we saw above. If 寒い (samui, “cold”) is one word, then should 寒くない (samukunai, “not cold”) and 寒くなかった (samukunakatta, “was not cold”) also be one word? Should they rather be two words each (samu kunai, samu kunakatta) or three words each (samu ku nai, samu ku nakatta)? But then should samu i be two words also for consistency’s sake? And what on Earth would one do with a word such as 清涼飲料水 (seiryouinryousui, “soft drink,” lit. “refreshing drink material water”)? What about ka na, kan ji, ni hon, mei ji, and so on? Does hiragana change to hira ka na or does it get to stay hira ga na? Most rules in Japanese depend upon the lack of spaces between words. Perhaps this problem is not as large as I make it out to be, and perhaps spaces could be instituted easily with no harm. The German language does just fine with spaces and absurdly long compound words, after all (geschwindigkeitsbegrenzung immediately springs to mind). Until an ideal solution is reached all parties and viewpoints seem to be at an impasse. Perhaps you take the position, as I do, that kanji is just a fact of life and you might as well enjoy it as best you can, or perhaps you desire to go back in time to the 4th century and give an alphabet/syllabary to the Japanese people to ensure that they never adopt Chinese characters. Whatever the case, it can certainly be said that Japanese is unique and interesting, and it will be exciting to watch what happens next. Miller, Roy Andrew. The Japanese Language in Contemporary Japan: Some Sociolinguistic Observations. American Enterprise Institute for Public Policy Research. 1977. Print. Sakade, Florence. A Guide to Reading and Writing Japanese, Third Edition. Tuttle Language Library. 2003. Print. Seeley, Christopher. A History of Writing in Japan. University of Hawai’i Press. 1991. Print. Yeounsuk, Lee. The Ideology of Kokugo: Nationalizing Language in Modern Japan. University of Hawai’i Press. 2010. Print.